The German Empire post offices in China began operation in 1886. Initially, contemporary German Empire definitive postage stamps were used. These are called "forerunners". Many of these are not expensive, and collecting these forerunner issues is very popular with German postmark collectors. The six postage stamps shown above were overprinted for German Post Offices in China between March and June 1898. These stamps feature a 45° diagonal overprint. The 3 Pf. denomination is scarce. The other denominations are relatively common. Vertical gutter pairs exist of all the stamps in this set. Gutter pairs of the 5 Pf. through the 50 Pf. denominations, surprisingly, are not unreasonably expensive! 03 Pf. (1898 - 45° - Mi. #1I, Sc. #1c) - Yellow Brown, Reddish Ocher, Gray Brown. 05 Pf. (1898 - 45° - Mi. #2I, Sc. #2a) - Green. 10 Pf. (1898 - 45° - Mi. #3I, Sc. #3a) - Carmine. 20 Pf. (1898 - 45° - Mi. #4I, Sc. #4a) - Ultramarine. 25 Pf. (1898 - 45° - Mi. #5I, Sc. #5a) - Orange. 50 Pf. (1898 - 45° - Mi. #6I, Sc. #6a) - Red brown. The six German Empire postage stamps shown above were overprinted for German Post Offices in China during December 1898. These stamps feature a 56° diagonal overprint. Vertical gutter pairs exist of all the stamps in this set, and they are all inexpensive, being about four times the price of a mint single in the Michel catalog. 03 Pf. (1898 - 56° - Mi. #1II, Sc. #1) - Yellow Brown, Reddish Ocher, Dark Brown. 05 Pf. (1898 - 56° - Mi. #2II, Sc. #2) - Green. 10 Pf. (1898 - 56° - Mi. #3II, Sc. #3) - Carmine. 20 Pf. (1898 - 56° - Mi. #4II, Sc. #4) - Ultramarine. 25 Pf. (1898 - 56° - Mi. #5II, Sc. #5) - Orange. 50 Pf. (1898 - 56° - Mi. #6II, Sc. #6) - Red brown. The image above shows an authenticated COMPLETE SET of the regularly-issued Boxer Rebellion Provisional overprints of 1900-1901 (Mi. #7-14, Sc. #16-23). These were used primarily in Foochow and Tientsin. Most Germany stamp collectors will NEVER OWN any authenticated examples of these stamps! I created this image by combining the images from an old Spink auction catalog that I found on the internet. The combined 2012 Michel Deutschland-Spezial-Katalog value of mint lightly hinged examples of these eight stamps is €36,250. Considering the prices realized, which were in Pounds Sterling, I have a feeling that they sold for much more than the catalog value. The 25 Pf., 40 Pf., 2 Mark, and 3 Mark denominations were also overprinted in this manner, but they were never issued. For the most part, they are unobtainable. If you really want to collect Boxer Rebellion stuff ..... Try collecting the German Empire definitive postage stamps of this period with China Feldpost postmarks. There are numerous varieties, and they are infinitely cheaper than the provisional postage stamp issues. The thirteen German Empire stamps of 1900, shown above, were overprinted for German Post Offices in China between 1901 and 1904 (Mi. #15-27, Sc. #24-36A). In the same manner as the 1900 Representative Subject issues of Germany, the Mark denominations come in multiple types. For detailed information, please refer to the Germany - Empire / Germania Issue - 1900 page and the Michel Deutschland-Spezial-Katalog volume one. The ten German Empire stamps of 1902, shown above, were overprinted and revalued in Chinese currency for German Post Offices in China during October 1905 (Mi. #28-37, Sc. #37-46). The 1/2 D. and 1 1/2 D. denominations come with 26 x 17 perforation holes and with 25 x 16 perforation holes. 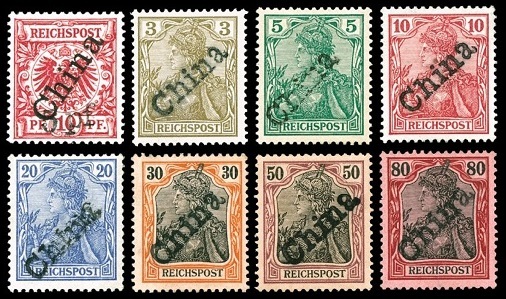 The ten German Empire stamps of 1905-1913, shown above, were overprinted and revalued in Chinese currency for German Post Offices in China between 1906 and 1913 (Mi. #38I-47I, Sc. #47-56). These stamps were all from the Peacetime Printings. Wartime printings were made in 1918 and 1919 (Mi. #38II / 47II, Sc. N/L). They were printed in Berlin, for sale to stamp collectors, and they were never placed on sale at the German Post Offices in China. There are many varieties on the high denomination stamps, including the number of perforation holes, stamp shades, overprint shades, differences in overprint spacing and measurements, etc. For details, refer to the Michel Deutschland-Spezial-Katalog volume one. After China declared war on Germany in 1917, all the German Imperial post offices were closed.